Have you always wanted to tour India? Witness the ancient history, the vibrant culture, and enjoy the mouth-watering food? 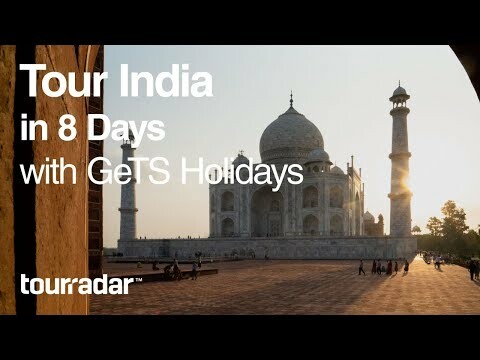 Whether you’re planning your dream trip right now, you’re daydreaming about all of the options you have, or you’re just really craving a curry, join TourRadar and GeTS Holidays as we explore this 8-day itinerary of India! A visit to the country’s capital of Delhi is first on the agenda. Here, you’ll spend two days sightseeing, wandering massive bazaars like Chandni Chowk, and visiting monuments such as the final resting place of Mahatma Gandhi. Take a ride in a rickshaw, explore ancient ruins, and, of course, eat your fill of delicious local food! Next, visit Agra. Once the capital of the Mughal Empire, today this bustling city contains countless remains of a powerful 17th-century empire. You’ll visit possibly the most iconic site in all of India; the Taj Mahal. You’re sure to feel like royalty as you explore the grounds of this beautiful monument to true love. Cameras ready! The next two days are spent in Jaipur, or, as it’s sometimes known, the Pink City. Named for the pink sandstone used in much of its architecture, you’ll find plenty of memorable photo-ops in Jaipur. There’s also opportunity to see the world’s largest sundial, and visit some famous markets for a little retail therapy! The final stop in this incredible tour is Varanasi. Known as one of the holiest places in the Hindu religion, you’re sure to see many embarking on a pilgrimage to the River Ganga. It’s said that dipping in this water will wash away sins. It’s the perfect place to wrap up a whirlwind tour of India – find some peace before heading back home! If you’re ready to experience all that India has to offer first-hand, why not start planning a trip here for yourself? Head over to TourRadar to view this itinerary and others like it!